Long before food trends would be whisked in with the rigor of beating egg whites to stiff peaks, I experienced the novel idea of a Chili Stuffed Baked Potato. Somehow it didn’t seem novel, or at least trendy to me at the time, it was the Southwest after all. In fact, the combination seemed to make perfect sense, and I thought it delicious. 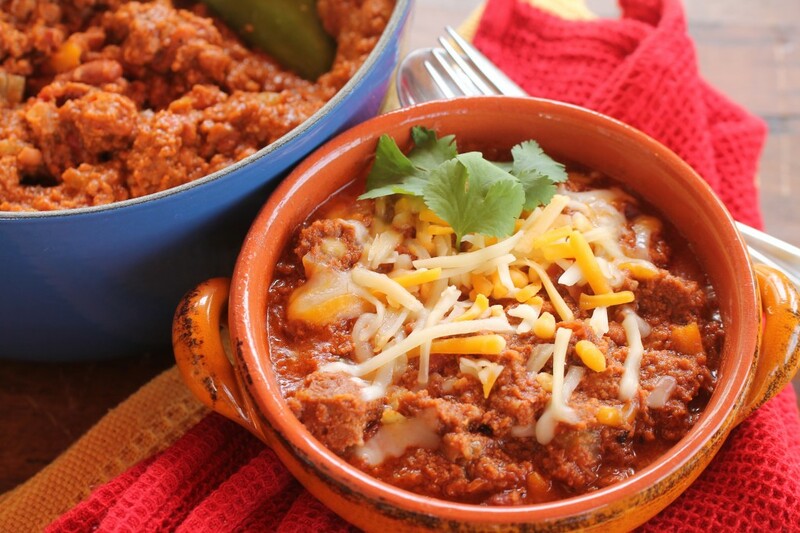 A dollop of creamy white sour cream, highlights of golden colored shredded cheddar cheese, finely chopped green onions sprinkled all about continue to magically transform a good hot crock of spicy chili to its well-deserved heights. These same ingredients also continue to complement the glorious baked potato, though just for historical purposes, you more frequently had to pay ‘extra’ for the sour cream on your baked potato at a number of dining establishments in the old days, including many of those steak centric. Chili in the course of its national history, has, in many parts of the country continued to maintain its traditional fervent core, with beans or without. Chili has too also been transformed even among the simpler chili versions crowd such as in the use of now mainstreamed spices; cayenne pepper, Mexican chili powder, Spanish smoked paprika, and in the creative use of more diverse base ingredients such as ground turkey or chicken to those of vegetarian specialties. Still, anyway you cook it, chili always earns the distinction for its ease of preparation, good flavor, and with an added benefit that it can also be frozen for later use. 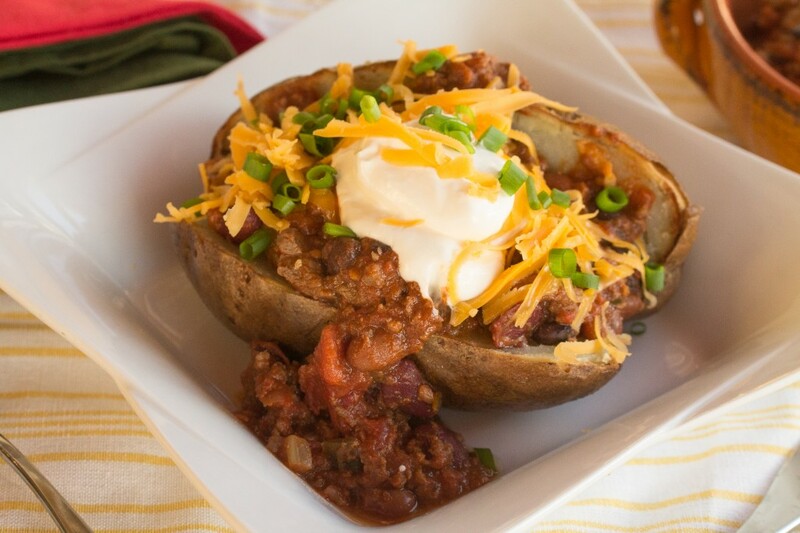 When it comes to hot cooked chili, sprinkled or dolloped with tasty colorful toppings, whether it’s traditional, novel, or trendy, it’s always delicious, the Chili Stuffed Baked Potato. The Pot of Chili will serve 8 and may be frozen. On very low heat add bacon pieces and oil into a large soup or enameled iron pot. Cook bacon around five minutes, stir in the chopped onions and celery cook on very low heat another five minutes, add in the hot peppers and garlic, stir well, cook another three minutes or until peppers begin to soften. Scrape in ground beef and stir throughout with the vegetable mixture, raise heat to medium low and cook until meat begins to brown, then stir in beef cubes. Once beef has lost its color sprinkle in the spice mixture, stir throughout, let spices cook for three minutes, add in whole tomatoes with liquid, shredded chocolate, brewed coffee, beef stock and bay leaves, reduce temperature back down to very low and simmer around twenty minutes. Add in all of the beans, continuing to simmer chili on very low heat, stirring occasionally, for at least forty-five minutes or longer until flavors fully develop together. Serve hot. Place baked potato opened in the center into a shallow bowl, pour ladle full of chili over. Top with a dollop of sour cream, shredded cheddar cheese, sprinkle with chopped green onions. This entry was posted in Meats and tagged Chili, Chili Stuffed Baked Potato, Stuffed Baked Potato. Bookmark the permalink. Post a comment or leave a trackback: Trackback URL. Oh this takes me back! 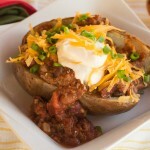 My mom used to make baked potatoes with chili in them all the time growing up! Such a great fall dinner! Thanks for the recipe! Rachel recently posted…Nap Time is ME Time! Hi Rachel, wow, that’s interesting about your Mom! I never experienced chili in a baked potato before having one at some restaurant in Arizona in college so perhaps your Mom was a real progressive! Thanks for stopping by and sharing! I love chili. And I love that you included the onions. They provide a little crunch, which I love. I am a traditionalist when it comes to chili…in the bowl with sour cream and maybe even a little guac. I never had it in the potato. It makes it all the more hearty and perfect for an easy weeknight meal. 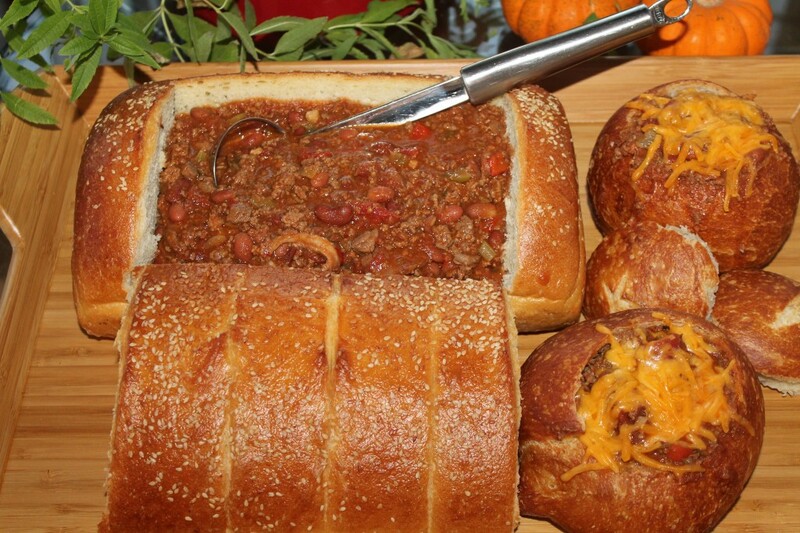 Hi Kelly, The baked potato is an interesting and delicious twist but then I am a chili enthusiast at heart and enjoy it most anyway including in bread bowls with melted cheese. I’ve never put guac on my chili though it sounds great. 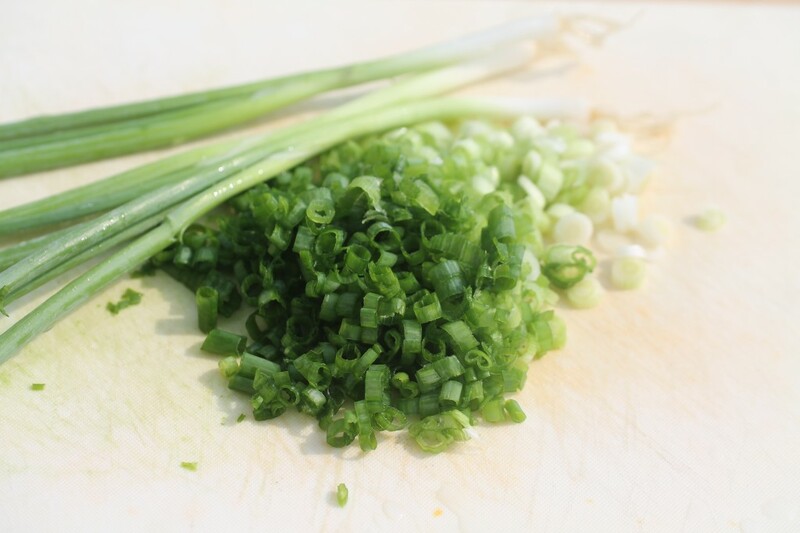 Agreed on the green onions for the added crunch, I also enjoyed raw chopped onion when offered in a buffet setting. Thanks much for joining in. Just think you will be transformed to the world of French food in mere weeks now! Dear Peggy, you certainly have a way with delicious comfort-style family food (if I may call it that way) – I make chili con carne every once in a while but it is probably not the most authentic of versions (around here this is not a common recipe) – I usually serve it with rice etc. but will make some chili-stuffed-potatoes next time and follow your recipe closely for more delicious authenticity! 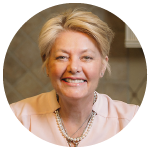 Thanks so much Andrea, its great to hear from you. Yes, chili is quite a popular dish in the states, and with many regions having their own specialties. I think you will enjoy this dish very much though and with its combination of spices, kicking it up or mellowing it down to suit your own taste. Thanks for joining in!